Leaves’ Eyes were formed in 2003 by Liv Kristine after her departure from Theatre of Tragedy. The rest of the band is made up of the line-up of German death metal band Atrocity, of which Liv’s husband Alexander Krull is the lead vocalist. The band play symphonic metal, with many folk/Viking elements. King of Kings is their sixth studio album. King Of Kings is a return to Leaves’ Eyes Viking roots, where last album Symphonies Of The Night took a trip into more gothic, literature-inspired territory. It tells the story of Harald Fairhair, the first King of Norway, and the Battle of Hafrsfjord, which is commemorated by the famous “Sverd i fjell” (swords in rock) monument. Intro Sweven is a taster of what’s to come, leading into title track King of Kings. This song repeats itself a lot and is a bit of a slow burner, but the end result is intense and anthemic. It introduces the concept of the album and gives you a sense of King Harald’s importance. Halvdan the Black follows, a storming track reminiscent of Hell to the Heavens from the previous record. This tells the story of Harald’s father, and it was already a fan favourite after being previewed at many live shows (you’ll soon be shouting “Halvdan! Halvdan the Black!” along with Alex). It starts with an almost tribal opening before leading into a more traditional symphonic metal song. The Waking Eye is the lead single of the album, and it’s a good fit. It has a hint of Elegy about it, being very melodic and with a chorus that will easily get stuck in your mind. Liv’s voice is beautifully soft on this one – her softer tones are used to great effect on this record. This is a good point to mention the choir as well – the band worked with the London Voices Choir (known for their work on the soundtracks of Lord Of The Rings and Star Wars) and it really adds to the cinematic feel of the record. Then we get another short intro in the form of Feast Of The Year, which leads into Vengeance Venom, a folk metal epic with a rousing singalong chorus that could easily be at home alongside bands like Ensiferum. Sacred Vow is up next, a more epic track with a great melody that increases in intensity as it progresses. There is no filler here; each song feels like it belongs as part of the story. Edge Of Steel features Simone Simons of Epica on vocals, a welcome guest. Her voice doesn’t drastically stand out (it could’ve been used to greater effect) but instead it does blend pleasantly with Liv’s to create a memorable warrior’s chant. It’s followed by Haraldskvæði, a mournful hymn to the fallen which is perhaps one of the most beautiful and moving songs the band have ever done. It feels truly authentic, is if you’re hearing something from long in the past. The climax is Blazing Waters, the gem of the album – the piece that shows you the Battle of Hafrsfjord. This song is treated to a few more minutes of playtime than the others, and it deserves it. Haunting, strange voices lead into as symphonic/folk masterpiece, King Of Kings’ equivalent of the band’s classic Frøya's Theme. It doesn’t quite reach the heights of that song, but it certainly comes close. Again there’s a cinematic feel, as if you could watch the battle playing out before your eyes. Lindy-Fay Hella of the band Wardruna also guests on this one. Finally, there’s a stirring closer in the form of Swords In Rock. This jaunty tune is incredibly fun (you might find yourself dancing a jig while listening to it) with sword sharpening, wolf howls and chanting men, and Liv’s joyful voice leading them all in a chorus. But it’s also more than that. It’s a summary of the album, a testament to Harald Fairhair in the same way that the Sverd i fjell monument is. It shows that once the battle is over, when a life is complete, the legend remains. The story is never lost, but instead echoes throughout time. 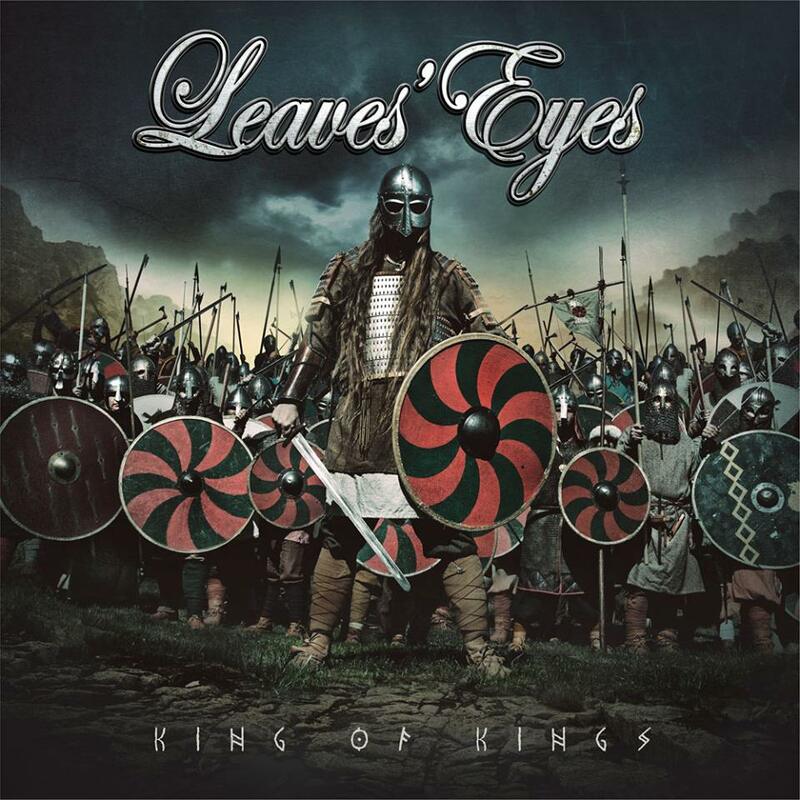 This album is a brilliant achievement from Leaves’ Eyes, and one that is sure to please long-time fans of the band. They have succeeded in telling a great story with music, and made the best use of orchestra, choir and folk instruments. A must-listen for those who enjoy symphonic and folk metal.